Veterinarians in BC did not often diagnose this disease in the past. However, we have seen increase in cases in the past decade. This may be related to an increase or spread of the organism itself, or it may be related to improved diagnosis and the fact that we are encroaching more on wildlife habitats. While the initial cases were from some pockets in the North Shore, in the last few years, cases from the Granville Island area and the Fraser Valley have also been noted. Usually by somehow ingesting it — eating or drinking something contaminated by the urine of an infected animal. Stagnant or slow moving water provides ideal conditions for this bug. For example, a dog might lap water from a puddle or eat grass that was contaminated by the urine of an infected rat or raccoon. It can also enter the body through the skin or open mucosa; this can happen with humans who spend a lot of time in contaminated water, for example swimming, although this is less likely to happen in cool climates. The organism can survive for a long time in water or in moist soil, and we see an increase in cases after periods of high rainfall. We have diagnosed 10 cases in the past 3 months and this was likely due to the fact that there was record rainfall in the latter part of the year (before the cold snap occurred). Because Leptospirosis survives best at temperatures between 0–25o C, increased occurrence have been typically noted in late summer and autumn. The range of symptoms can vary widely from mild to life threatening depending on the immunity of the patient and the virulence of the specific strain. How the disease affects the body can vary widely, but typically we will see dogs with signs of kidney and liver damage; sometimes the lungs are involved. 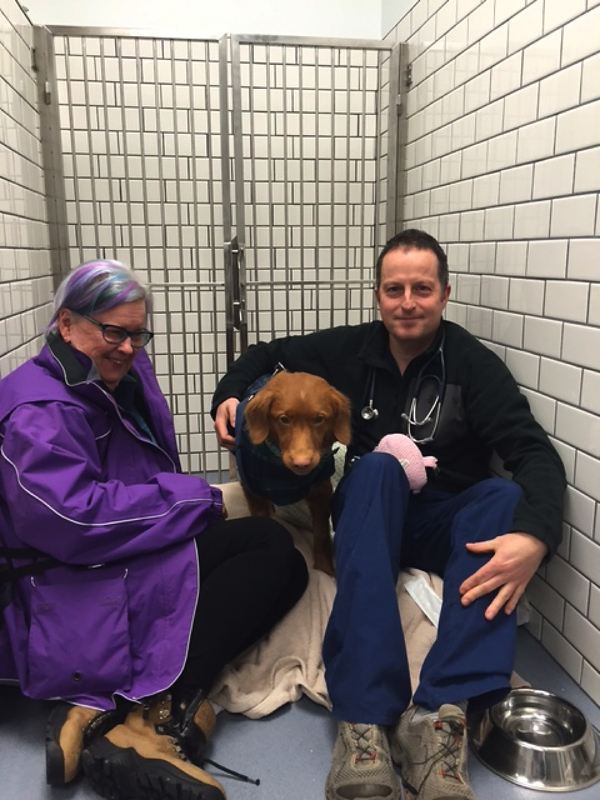 In the past few years, advances in blood and urine tests have made it easier to diagnose in the veterinary hospital. If your dog seems achy or dull, lacks appetite, has vomiting or diarrhea or blood in the urine, please see your family veterinarian. With antibiotics, either as an outpatient if the symptoms are mild, or in hospital for the sicker patients. 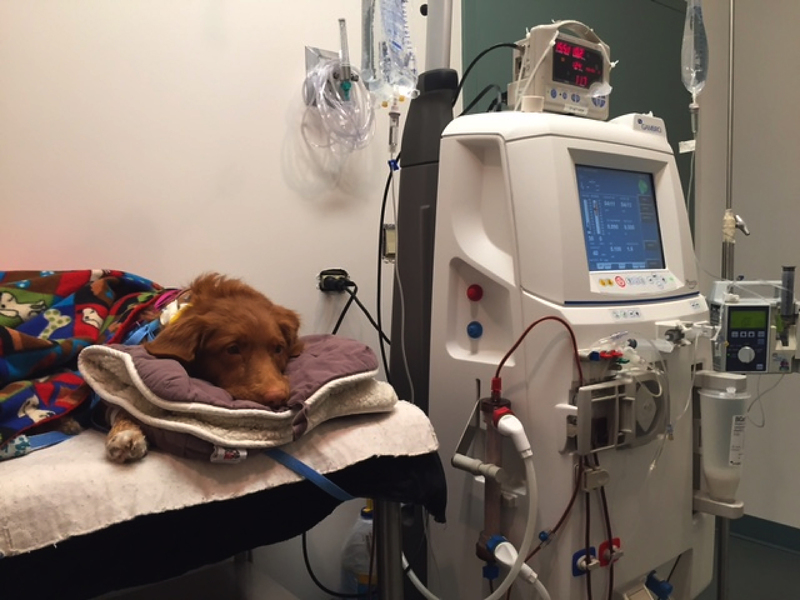 In dogs that have kidney injury, dialysis may be needed to keep them alive until they start to recover. Depending on the severity of the disease, the prognosis can be anywhere from good to grave, and some patients do not survive. The vaccine in the 70’s and early 80’s was likely to cause reactions (some mild, some severe including deaths). They are much safer now, but as with our human flu vaccine, the serovar that is being protected against is not always possible to predict. Currently the vaccine protects against 4 serovars. Circumstances vary, so talk to your vet about whether vaccination is appropriate for your pet. Bluebell received two dialysis treatments in our hospital over several days while her kidneys were recovering and then was discharged back to her loving family. Her kidney function is almost back to normal and we expect she will likely make a full recovery. 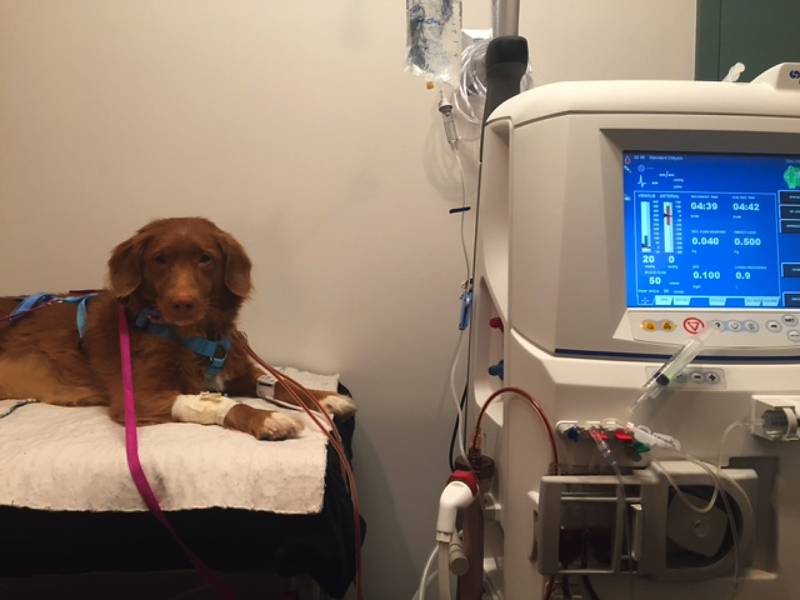 Bluebell and our new dialysis machine – a perfect pair!